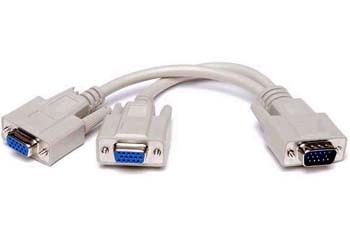 With using this VGA Y splitter cable, users can send computer video to 2 VGA digital displays at the same time. Perfect for presentations by sending your computer screen signal to two separate VGA monitors, LCD monitors or projectors. This double-shielded VGA splitter cable is featured to provide crystal clear video transmissions with high-resolution images, perfect for public video broadcasts, retail store, sales presentation and other multimedia events. Fantastic video adapter cable and an easy solution when you need a monitor and a projector displaying the same screen. This VGA Y splitter works with any two VGA displays that use standard 15-pin plugs. Double-shielded foil and braid for high-resolution imaging. Heavy-duty molded strain relief provides increased flexibility and durability. Gold connectors provide maximum corrosion resistance for error-free data transfer. Splits VGA output from a video card, VGA switch or a video converter for providing simultaneous video images on any two DVI-capable displays. Easy solution for displays at tradeshows, public video broadcasts, retail store, sales presentation and other multimedia events. Connectors: HD15 Male to 2 x HD15 Female.